Liverpool outclassed Derby to move to the top of the Premier League table for the first time under Rafa Benitez. Xabi Alonso opened the scoring with a 45-yard free-kick that sailed straight into the net before Ryan Babel's turn gave him space for a superb second. Fernando Torres' cool finish made it 3-0 and Alonso added a fourth with a rasping drive from the edge of the box. Andrei Voronin tapped home to make it 5-0 and Andy Todd's mistake let in Torres to complete the rout. It was an utterly dominant performance from the Reds, who have now won five out of their six games in all competitions this season - but none as easily as this. They always looked like extending their impressive start to the season against a Derby side lacking ambition and devoid of ideas. There was little to cheer Rams boss Billy Davies with his side merely hanging on from the start. Bywater did well to keep out Agger's 25-yard shot after it clipped off Derby defender Robert Malcolm and had to dive to stop a Torres header soon after. Liverpool then spent an unsuccessful spell trying their luck from distance but, when Alonso did break the deadlock on 27 minutes, it was also from long range. The Spanish midfielder was not trying to find the net when he curled in a free-kick but Kuyt ran across Bywater's line of sight and the keeper could not react in time to keep the ball out. Derby could probably count themselves slightly unlucky in the manner in which they conceded but they could not argue that Liverpool deserved their lead. And there was nothing fortuitous about the way Babel made it 2-0 before the break with his first goal since his £11.5m summer move from Ajax. The Dutchman collected the ball from Alvaro Arbeloa's pullback, bamboozled Andy Griffin and Claude Davis with his first touch and then buried the ball past Bywater for a goal of genuine class. Things continued in the same vein after half-time and Alonso should have added to Liverpool's advantage when Arbeloa, Torres and Kuyt combined to tee him up with only Bywater to beat. A third goal duly arrived when Javier Mascherano fed Torres and the Spanish striker made for goal before slotting coolly home. Derby simply had no answer to Liverpool's pace and movement going forward and, when another attack was not properly cleared, Alonso notched again with a precise shot into the bottom corner. Torres was clearly enjoying himself too and he played a part in Liverpool's next goal, exchanging passes with Kuyt who saw his shot saved before substitute Voronin followed up to score. And it was apt that Torres rounded off the scoring, nipping in when Todd failed to deal with Voronin's lobbed through ball and sliding the ball home. A miserable day for Derby was summed up late on when Craig Fagan failed to make contact with the ball with only Jose Reina to beat and Davies will have few positives to take away from such a demoralising defeat. "It was an almost perfect performance. In the first half we missed lots of chances and it was only after the third goal that the game was over. "We knew Derby had a good team spirit and we did a professional job. "I am very happy to be top but it is just for one day. It is nice to score six but there is a long way to go." "We started well and I felt we were quite comfortable for the first 20 minutes. "But our timing to concede a second goal before the break was terrible and the second half was a calamity. "We are still not competing in the manner we should and we won't pick up points until we start doing so." Liverpool: Reina, Finnan, Hyypia, Agger, Arbeloa, Pennant (Benayoun 61), Mascherano (Sissoko 77), Alonso, Babel (Voronin 73), Torres, Kuyt. Subs Not Used: Itandje, Riise. 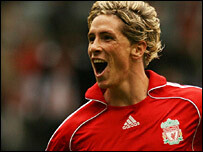 Goals: Alonso 27, Babel 45, Torres 56, Alonso 69, Voronin 76, Torres 78. Derby: Bywater, Griffin (Moore 80), Malcolm (Teale 59), Davis, Camara (McEveley 63), Todd, Fagan, Oakley, Mears, Pearson, Howard. Subs Not Used: Price, Earnshaw.